In 2012, FABB continued to be a strong local voice for all those who want to bicycle comfortably and safely in Fairfax County. This past year saw the completion of the Fairfax Bicycle Master Plan and the first Fairfax Bike Summit in addition to considerable activity on the biking-to-school front. 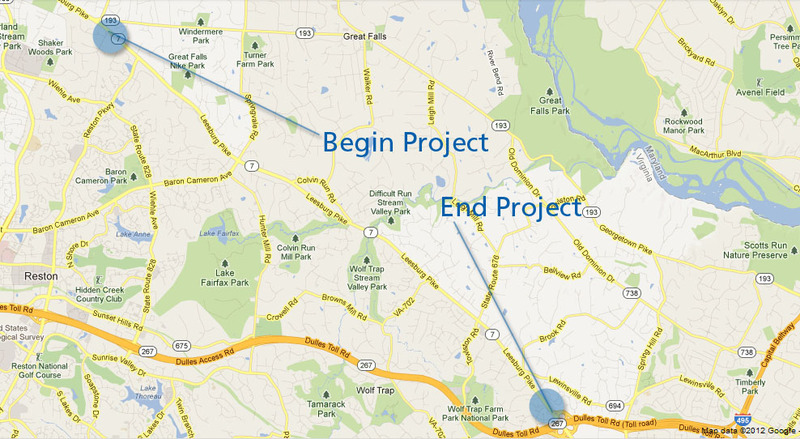 Fairfax County Bike Master Plan: Extensive work on the on-going bicycle master plan project occurred in 2012. At the start of the year, 70 residents attended the Burke-Springfield bike plan meeting, just one of eight regional meetings held around the county to receive public input. FABB representatives served on the bike plan advisory committee, attending many meetings dealing with detailed aspects of the plan. FABB representatives also participated in focus groups related to economic impacts, health, safety, school transportation, and law enforcement. Based on earlier field work and the extensive public and committee input, the contractor presented the final draft route network and a map of the final bicycle route recommendations. The county currently is finalizing the plan. An important FABB goal is to ensure that the plan is approved by the Planning Commission and Board of Supervisors in 2013. 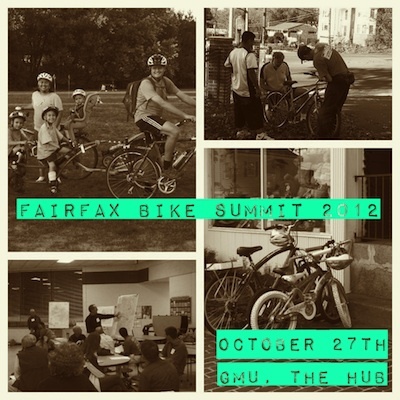 Successful Fairfax Bike Summit: The Fairfax Bike Summit was on Saturday October 27 with almost 140 attendees. Andy Clarke, the president of the League of American Bicyclists, was the keynote speaker at this inaugural event held at George Mason University. As the day progressed, speaker after speaker detailed ways to bring better and safer conditions to Fairfax. The summit also included refreshments, vendor displays, and a bike tour of the campus. FABB presented awards to Fairfax County Bicycle Coordinator Charlie Strunk and VDOT Traffic Engineer Randy Dittberner for their work on behalf of bicyclists; both are avid transportation cyclists. The summit was a great chance to meet other bike advocates and people interested in making Fairfax a better place to bike. See the Ideas for Moving Forward submitted by attendees during the summit. We heard much positive feedback about this event and hope to organize more such events in the future. 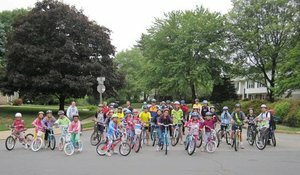 Safe Routes to School (SRTS) for Fairfax kids: For several years, FABB has been working with both Fairfax County government and Fairfax County Public Schools, encouraging them to embrace a system-wide effort to get more children to walk and bike to school. In January, the Fairfax County School Board adopted a policy that clarifies that parents make the final decision as to whether their children bike to school. This policy also added language that encourages kids to walk and bike to school, and the school system encouraged participation in the inaugural Bike to School Day in May. Jeff Anderson has been leading the charge for FABB and in 2012 brought national exposure to local efforts. In May, WAMU's Metro Connection interviewed Jeff and his children, while Wolfie’s Bike Train, led by Jeff, was featured on Nickelodeon and in an international report by Nike. The heightened exposure generated considerable interest, and school-related efforts are springing up in many parts of the county. Terra Centre Elementary School and Cunningham Park Elementary School received infrastructure funds, and a number of additional local schools received mini-grants from the VDOT SRTS program. See the FABB SRTS page for details. We hope to see more programs develop and many more children riding in 2013. FABB volunteers out and about in the community: FABB representatives continued to speak at many public meetings, appeared in media articles, and provided input to various committees. FABB volunteers attended almost 100 meetings over the course of the year, including 30 directly related to the bicycle master plan. Volunteers came out in all weather for bike rodeos, bike valets, bike counts, Bike to Work Day events, Tour de Fat festival, and more. 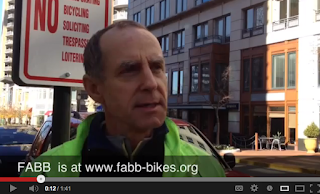 Plus many FABB volunteers were involved in planning the Fairfax Bike Summit. New and old modes of communication: We posted more than 310 articles on the FABB blog, sent our bi-monthly newsletter to 1,400 folks, and have several FABB columnists on the Patch media sites. In our social media outreach, FABB has 600 friends on Facebook and more than 1,200 followers on Twitter. Back in the real world, we continue meeting on the third Wednesday of every month at Patrick Henry Library in Vienna. As always, all are welcome at the monthly meeting: next meeting will be Wednesday, January 16 at 7:30 p.m.
First bicycle fatality since 2010: A cyclist was killed crossing Columbia Pike in November when she was hit by a motorist driving a pickup truck. At this location, Columbia Pike is a high speed arterial road with no bike facilities, and apparently the cyclist was trying to cross over to the Barcroft Plaza Shopping Center. FABB subsequently placed a ghost bike near the site of the crash. As well as acting as a memorial to this cyclist, the ghost bike is intended to remind passing motorists to share the road. We continue in our on-going efforts to improve the safety of county roads for all cyclists. News from our state & local agencies: Garrett Moore, VDOT Northern Virginia District Chief, was recently named the Chief Engineer for the Commonwealth so we are expecting to see someone new appointed to the district position in 2013. Meanwhile, Fairfax County Department of Transportation hired a new bicycle (and pedestrian) staff person to work in the county bike program. In policy news, VDOT completed a strategic plan to guide their SRTS work in Virginia through 2017. Thank you: We couldn’t do what we do without the support and assistance we receive from our volunteers, supporters, donors, and well wishers. A big thank you to all of you; we always appreciate people giving their time, energy, and skills. Thanks also to the public officials who patiently work with us on an on-going basis. We all are working for safety, access, and the health and well-being of our community. Good riding and always remember to use lights after dark. Fairfax Advocates for Better Bicycling is a grassroots initiative, affiliated with the Washington Area Bicyclist Association, aiming to make bicycling an integral part of Fairfax County's transportation network. Visit us on the web. At the Fairfax Bike Summit we asked participants to tell us what they thought Fairfax needs to do to become a more bike-friendly place. These were called Ideas for Moving Forward. We've organized the ideas into categories reflecting the 5 E's, Engineering, Encouragement, Education, Evaluation, Enforcement. We've added a couple of other categories, Maintenance and Advocacy. Engineering Concentrate on infrastructure. Push politicians to work!!! Engineering Add a put in parking lot at the intersection of Towlston Rd and Rt 7 on both sides. VDOT already has ownership of a small strip on northeast corner. Encouragement Need to hold one or more Fairfax Ciclovía events in which major streets are closed to auto traffic. Encouragement Throw a party to bring bike friendly streets idea to the general public. Declare a bike friendly street party one weekend or holiday. Close a section of a major road to traffic. Add vendors, music, food, businesses. Start the party with a bike ride. Encouragement Bicycle advocates need to more effectively communicate what we offer: Lower incidences of overweight/obesity, lower public health costs; Favored by young, well-educated workforce employees that add to the tax base; If we get the curious but less experienced residents on bikes it reduces congestion and supports local retail, reduces pressure on WMATA when transportation funding is reviewed as zero sum game, we lose. We need to more effectively communicate what cycling infrastructure can offer Fairfax County. Education Safer paths from southwest Fairfax City to W&OD Trail and Vienna Metro; Advertisement making residents aware of cyclists and to please respect their space; Education for motorists, pedestrians, & cyclists to make them aware of each other & teach them the rules that each should obey. Education Bicycle awareness campaigns, rules of the road for bicyclists, and information for motorists on how to ineract with bicyclists. Education Target libraries, universities, public and private schools, hospitals to distribute bike maps and literature to promote biking. 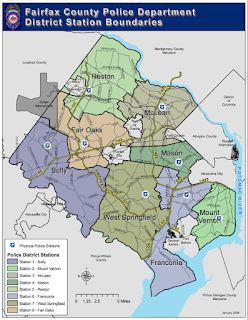 Please link the Bicycle Master Plan with the Fairfax Co Master Arts plan in Tysons Corner and other art venues. Enforcement Increase enforcement of safe driving, in particular intersections. Why can't we have more traffic cameras to enforce traffic laws? ,Impose tax on off-street parking, and provide off-setting credit for bicycle usage of the facility (mall, office, etc) served by the off-street parking. Enforcement Support speed and crosswalk cameras within 1.5 miles of schools to slow traffic and promote pedestrian and bicycle safety. It would coincidentally generate revenue for Fairfax County transportation funding. This would require a specific request to Richmond for authority. Enforcement No public trails are to be closed at night to bicyclists with lights which meet Virginia Code requirements. Bicyclists without lights should be targeted for fines or at least severely mocked. Maintenance Best bang-for-the-buck is street sweeping. There are areas such as Annandale Rd with built up debris and tree limbs left over from Derecho clean-up. Also construction zones leaves nails, screws, etc. on the shoulders. Particularly dangerous at night. Maintenance What efforts can be done to remove bikes abandoned at Metro station bike racks? WABA recently created the Women & Bikes program "dedicated to helping women ride bikes more often and more enjoyably." WABA member Megan Jones came up with a great idea to help raise funds for the program, the Hains Point 100. 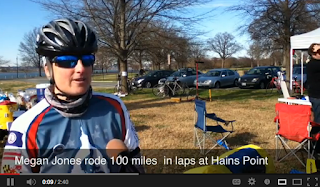 She committed top riding 100 miles around Hains Point on Sunday. Word spread about her challenge and over 50 people joined her to help raise over $1,500 for WABA. Read Alex Baca's account of the ride on the WABA blog, WTOP report Kate Ryan's report on her blog Lane Change and her interview with Megan on Youtube, and Chasingmailboxes report with lots of photos. The Transportation Planning Board (TPB) was recently asked to amend the long range plan to include the widening of Route 1 from Fort Belvoir to Mt. Vernon Highway. The road will be widened to 6 lanes with a wide median that can accommodate future transit. Currently a 14-foot wide outside lane and a 10-foot shared use path are included in the design. The project is being funded and managed by the Federal Highway Administration. See the project website. Allen Muchnick of Virginia Bicycling Federation testified before the TPB asking that bike lanes be added to the project, by narrowing the travel lanes to 11 feet and creating 4-foot bike lanes. With a design speed of 50 mph, a 14-foot outside lane is not adequate. Even 4-foot bike lanes are not sufficient given the high speed of traffic, but they are better than 14-foot wide outside lanes. At a minimum Allen asked that the outside lane width be increased to 15 feet. Several of the TPB members supported Allen's comments, including DC Councilman Mendelson and Hunter Mill District Supervisor Hudgins. The FHWA rep was asked to respond to their concerns at the January 23 TPB meeting. We'll be asking cyclists to send comments to the TPB in support of bike lanes in this project. by Allen Muchnick, VBF board member, December 19, 2012 I’m Allen Muchnick with the Virginia Bicycling Federation, and I’m speaking in reference to Item 15 on today’s TPB agenda, a request by the Federal Highway Administration to amend the TIP to include funding for widening US Route 1 through Fort Belvoir in Fairfax County. Sadly, this proposed highway widening project illustrates a serious shortcoming of the TPB’s Complete Streets Policy and a failure of both of the Federal Highway Administration and the Virginia Department of Transportation to adhere to their own long-established bicycle accommodation policies. This 3.4-mile segment of US Route 1 is the planned route of four, nationally significant, long-distance bicycling routes, three of which run from Maine to Florida; namely, AASHTOs US Bicycle Route 1, the East Coast Greenway, the Potomac Heritage National Scenic Trail, and the Adventure Cycling Association’s Atlantic Coast Bicycle Touring Route. As the Commonwealth of Virginia’s only north- south bicycling route (and even as the sole north-south bicycling route through the huge Fort Belvoir army base), this project should adequately accommodate experienced long-distance bicyclists who prefer to travel on the roadway which is considerably faster, much better designed and maintained, and arguably safer than the meandering shared-use path which will also be included in this project. 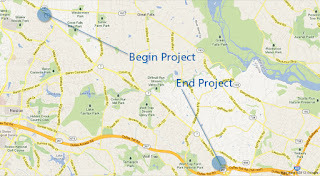 Since the mid 1990s, VDOT planning studies for the Route 1 corridor through Fairfax and Prince William Counties have consistently specified 15-foot wide curb lanes to accommodate bicycling, and 15-foot wide curb lanes for bicycling were specified in VDOT’s 2003 Route 1 Location Study and in the three draft Environmental Assessments which the FHWA endorsed in 2003. While 15-foot curb lanes are--at best-- a minimal bicycling accommodation on a roadway with 50 MPH design speed, the space could be striped as 4-foot bike lanes adjacent to 11-foot travel lanes to facilitate motorist overtaking and the comfort and safety of roadway bicyclists. Unfortunately, in designing the current project, the FHWA has narrowed the long-planned wide curb lanes to 14 feet. While non-cyclists may consider this 12-inch narrowing to be a minor, those lost inches have a big impact on a bicyclist sharing a travel lane with 50 MPH traffic. It’s illogical to consider a 12- foot travel lane to be a minimal accommodation for motor vehicles, yet maintain that, by adding only two more feet, a bicyclist, who tracks at least 3 feet wide and deserves at least 3 feet of safe passing clearance, can safely share that space laterally with 50 MPH traffic. For decades, both FHWA and VDOT have issued policies and guidance for accommodating bicyclists on high-speed roadways. As early as 1990, VDOT’s bicycle accommodation policy called for routinely providing appropriate bicycling accommodations on US Bicycle Route segments, and in 1994 FHWA published guidance that a 15-foot wide curb lane is a bare minimum bicycling accommodation on a 50 MPH roadway. Providing 15-foot curb lanes in this project does not require a wider roadway, although the proposed 27- foot landscaped median provides ample space for doing so. Instead, 15-foot curb lanes can be achieved simply by shaving 6 inches from the inside and middle travel lanes. We ask the TPB to require FHWA to provide at least 15-foot curb lanes for bicycling as a condition for adding this project to the TIP. In our effort to improve safety, access and sustainability, Metro is expanding our understanding of bike and pedestrian barriers faced in commuting to our Metrorail stations. Over the past several years, we have focused our bike and pedestrian project planning and implementation efforts on improvements we can make to our station areas such as, installing bike racks or constructing pedestrian improvements. Now, we’d like to expand the envelope and develop a list of access needs beyond our own boundaries and work with our jurisdictional partners to make needed improvements. One way we are doing this is by gaining a better understanding of where auto commuters come from when they drive to our stations, and zeroing in on areas where we see a good deal of auto access to determine if there are barriers to walking or biking to the station. 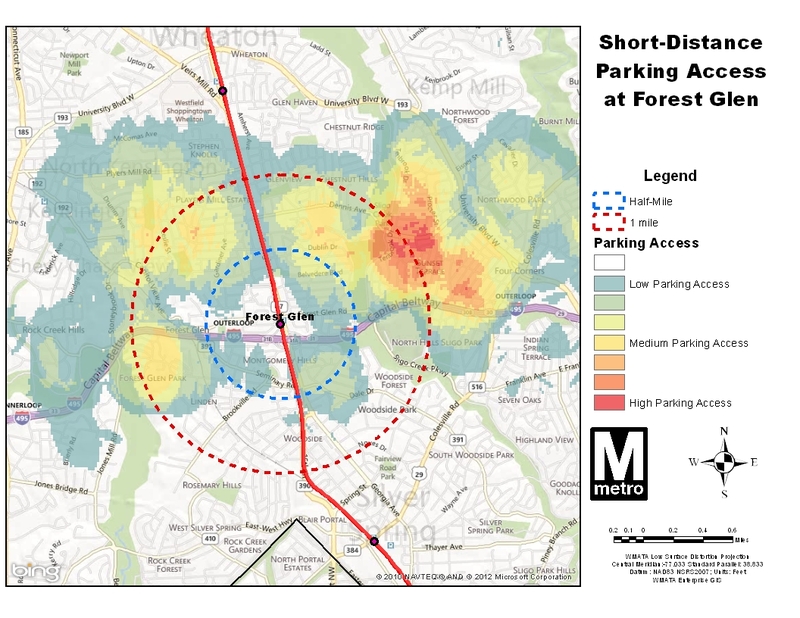 The map at right (full version) shows auto-to-station “hot spots” around the Forest Glen station, to pick one example, locations from which clusters of customers drive and park at Metro. According to the 2007 Metrorail Passenger Survey data, many customers drive from within a 1-3 mile radius; some are even closer. So why are so many people from this area driving? In our 2010 Bicycle and Pedestrian Master Plan, we teased out some of the more broad-based reasons why people drive rather than walk or bike – now we’d like to explore each station’s local conditions and see what can be done to improve walk and bike access. Yesterday I met with Lt. Grinnan of Fairfax County Police Department Traffic Division. The purpose of the meeting was to discuss cyclist harassment. At FABB we hear of many instances of harassment of cyclists by motorists. 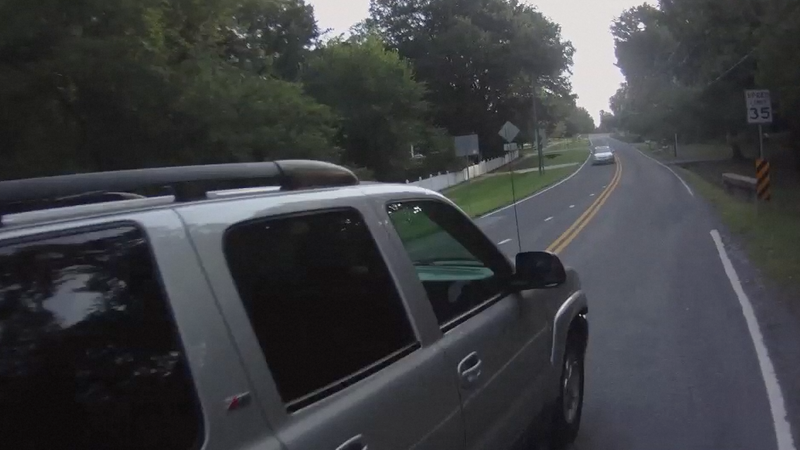 It's likely that anyone who regularly rides in Fairfax encounters dangerous and aggressive motorist behavior. I started the meeting by discussing FABB, our goals and projects. I explained that we represent cyclists who use bicycles for transportation and that many people rely on bicycles as their primary way to get around. Without a connected, safe bicycle network, we often must ride on congested commuter routes. I said that all too often we are harassed by motorists for no other reason than that we're riding a bicycle. 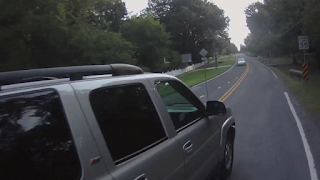 As a way of getting my point across I noted that on my ride to his office, on Woodburn Rd for a short stretch from the Cross County Trail, I was passed illegally by 4 motorists, one of whom honked, another two that drove completely into the oncoming lane of traffic, across a double yellow line. In one case approaching motorists had to nearly stop to avoid hitting one of the passing vehicles. One reason for the meeting was to discuss two recent reports of harassment, one on Vale Road in the Vienna area where motorists often illegally pass on a hilly section and they often pass closer than 2 feet. We later sent two short video clips showing examples of this behavior. The other instance involves a mother riding her daughter to school, with the daughter in a trailer behind the bike. A motorist on more than one occasion approached the mother, rolled down her window, and screamed about how dangerous it is to ride in traffic. Lt. Grinnan was very sympathetic. He agreed that motorists should be ticketed for their illegal behavior. He also confirmed that unless a policeman witnesses behavior that is a misdemeanor, a ticket cannot be issued by police to the motorist. However, a magistrate-issued summons can be issued to the motorist by an officer. Call the non-emergency number (703-691-2131) and request to speak to someone in the Citizen Reporting Section. Have the license plate number, description of the vehicle and driver, time of day, location. A case number will be generated. The information is entered into the Integrated Law Enforcement Automated Field Reporting Dispatch System (ILEADS) but the motorist is not notified. Call the non-emergency number and ask to file a police report. Have the license plate number, description of the vehicle and driver, time of day, location. If the information agrees with information on file, the driver is identified. Ask for the case number, name, address, and date of birth of the driver. This information is needed when contacting the Magistrate's office. Contact the Magistrate's office (in person). Ask to file a complaint against the motorist identified above. Provide the case number and personal information. A magistrate-issued summons could then be issued to the motorist by an officer. If the motorist contests the ticket, a court date will be set. Since the incident was not witnessed by an officer, he/she will not be present in court. When the case is heard, the motorist and complainant will have an opportunity to testify. We plan to test this system and will record responses received during each phase. In the past we have been discouraged from filing a report since "there is nothing we can do." We know there are some measures that can be taken but they require work on our part. We think it's worth the effort. Cyclists can also ask for increased enforcement on roads where cyclists are harassed. We have done so for a section of Vail Road. Contact the District station where the road is located. Provide specific information about time and place of incidents. Update: Here's the video clip of the close pass. Every morning, Dorien Van Herpen fills two red bags with items she’ll need later at work. She places them behind her seat, then pulls out of the family garage in McLean to begin her commute to Washington. If she hits Chain Bridge at just the right time, she catches the early sun rising over the Potomac River, on her way to the Washington International School. An hour later, husband Willem Janssen will trace the same route over Chain Bridge on his way to the World Bank. To access the Capital Crescent Trail from Chain Bridge, cyclists maneuver down a zig-zag ramp to the C&O Canal tow path. If they want to head north, they have to cross Canal Road, without a crosswalk, walk along the edge of the road to a wooded footpath that leads to the Crescent Trail. The other option is to ride the tow path south about a mile to Flecher's Cove, switch onto the Capital Crescent, then reverse direction and ride back north, to access places like Bethesda. "The C&O between Chain Bridge and Flecher's is the worst part of the entire path," says Laura Tuck, who started cycling to work on G Street with her husband, Jim DeMocker, in September. "Now, there are puddles and stuff, but it's like bone jarring, compared to outside, which is beautiful, they refinished." Tuck says the tow path can give you a headache, until you reach the pavement of the Capital Crescent. "It's just worse than washboard." "I think more people would do this, if they made that a more hospitable spot," said DeMocker. "Fist-size cobblestone type things, I mean, they just poke up. We recently created a FABB web page to summarize the various online Safe Routes to School resources, Safe Routes to School in Fairfax. Over the past couple of years FABB members have been working with an informal coalition of advocates to encourage more kids to bike to school. In order to accomplish that goal, we need safer bicycle routes, educated riders, and supportive parents and school staff. There are many challenges but we've made some progress. See our blog posts about FABB's Safe Routes to School-related work. If you have ideas for other information that should be included on the page, let us know. VDOT announced today that Garrett Moore, VDOT Northern Virginia District Chief, has been named the new VDOT chief engineer. Moore will be accountable for the quality, cost and timeliness of all engineering plans associated with VDOT construction projects. He will also be in charge of the maintenance and operations program of the third-largest state-maintained highway system in the country. As the northern Virginia district administrator, Moore led a complex transportation program resulting in the successful completion of the 495 Express Lanes; the start of the 95 Express Lanes; 25-mile resurfacing of the Fairfax County Parkway; significant expansion of the snow removal efforts, including increased use of technology and innovation; and many other projects. Last year FABB met with Garrett to discuss several bicycle-related issues including the need for better implementation of the VDOT bicycle policy, the need for better maintenance of bicycle facilities, including repaving of the Fairfax County Parkway trail, the need for a NoVa District bicycle advisory committee, and the poor quality of bike parking at the then new VDOT NoVa headquarters building. Garrett understood the issues, was realistic in his assessment of the challenges, and gave us hope that the issues would be addressed. A study has since been commissioned to assess the condition of the Parkway trail, using information that FABB collected. We're hopeful that large sections of the trail will be repaved in the near future. The ball is in our court to generate support among NoVa bicyclists for formation of a NoVa District bicycle advisory committee. It's on our list of things to do. We wish Garrett well on his new job. Listening to the morning news and hearing about the chaos on our roads caused by reckless, aggressive drivers, it's easy to come to the conclusion that our transportation system is broken. A single careless motorist can literally cause any of our major roadways to come to a crashing halt. 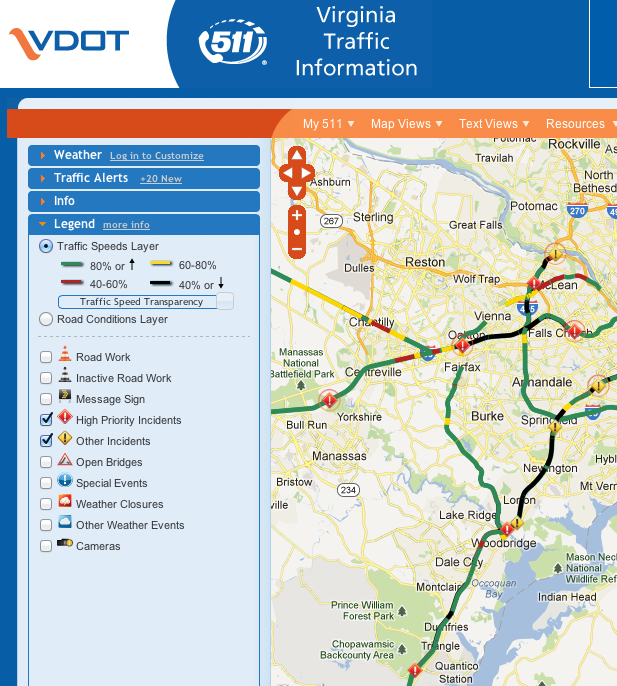 Nearly very day portions of I-95, I-66, I-395, the Dulles Toll Road, and our major state highways are affected by crashes. Building more and bigger major roads does little to solve that problem. To see current incidents on NoVa roads visit VDOT's 511 site. In the image on the right I've just selected "High Priority Incidents" and "Other Incidents" today at 5:50 p.m., the height of rush hour. Most of these incidents are "delays due to congestion," but others are likely due to crashes. Having transportation options is one solution to relying on roads where human error regularly causes delay. Cyclists know that their travel time to destinations is very consistent. A crash on the road or trail rarely affects cyclists. While delays on Metro are not unheard of, they are relatively minor compared to the problems commuters encounter daily on our roads. Having a connected road system would help too. Most of our neighborhoods contain cul-de-sacs that prevent connections with adjoining neighborhoods. Travelers are often forced onto arterial roads that easily become bottlenecks when overcrowded or blocked by crashes. Driverless cars can be another partial solution, but that technology will take many years to implement. 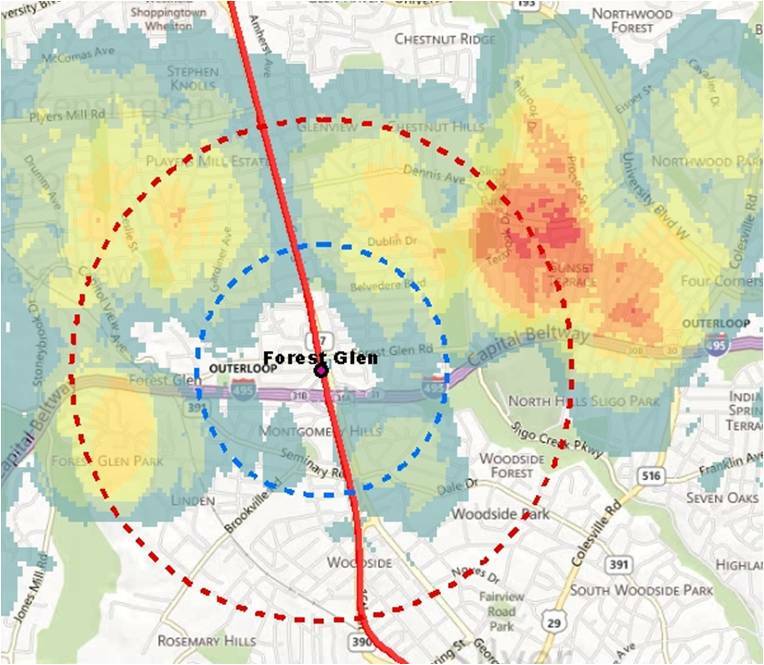 Developing a connected, safe, bicycle network would help greatly, especially in our more dense areas such as Tysons, Merrifield, Springfield, and inside the Beltway. This evening at 7 p.m. at Smith Commons, join WABA staff and bike-friendly fellows for a festive celebration (RSVP on Facebook here). There will be drink and appetizer specials, a raffle, and sweet seasonal tunes. Smith Commons is located at 1245 H St. NE, and you can park your bike (bring a u-lock!) in the neighboring parking lot. There’s a $5 suggested donation for WABA members. If you’re not a member, become one for the year for the discounted price of $25. You can sign up here or register at the door. Need a ride over to Smith Commons? The Assembly will be leading a group there, beginning at 6 p.m. at BicycleSpace at 1019 7th Street NW. WABA is creating three new positions and hiring two new staff. The new positions are Advocacy Coordinator, Outreach Coordinator, and Communications Coordinator. Current staff Greg Billing and Nelle Pierson will fill the Advocacy (Greg) and Outreach (Nelle) positions. Alex Baca was hired as the Communications Coordinator and a new Events Coordinator is being hired. I have presented and the Board of Directors has approved a restructuring of staff roles at WABA. To meet the need we have added staff capacity to have a full-time Advocacy Coordinator as well as a full-time Outreach Coordinator with responsibility for increasing our grassroots efforts outside the District. (Much of our outreach in the District is paid for through outreach/safety grants we have not been able to secure in Maryland or Virginia.) Greg Billing, who has played an advocacy support role and a communications role at WABA, will become our Advocacy Coordinator and will take the lead in facilitating a coordinated approach to regional advocacy, with the ultimate goal of using political pressure to get improvements from agencies like the National Park Service and the Commission of Fine Arts. Nelle Pierson, who many of you know as our Events Coordinator, will be overseeing our outreach activities and working to grow ridership and membership, as well as managing several of our targeted outreach campaigns in our newly created Outreach Coordinator position. I believe these roles better utilize the skills of Greg and Nellie and I am eager to see what they can deliver for WABA and the region. Without adapting we can continue to win the local battles but we would lack the capacity to bring the regional change that is needed. With this change and your support I believe we can win on both levels. As a WABA board member I strongly supported this restructuring. I think it bodes well for Fairfax. It was very encouraging to see a street sweeper on Soapstone Dr in Reston removing the accumulated leaves in the bike lanes between South Lakes Dr and Sunrise Valley Dr. You can see from this poor cellphone photo that the lanes on the near side are clean and the sweeper (in the distance) and following vehicle are sweeper the opposite side. It looked like the lanes on Lawyers Rd were relatively clean as well. Kudos and thanks to VDOT for being proactive and sweeping the lanes. They aren't much use to cyclists when filled with leaves and debris. Make Your Year-End Donation to Fairfax Advocates for Better Bicycling! As you make your end-of-year charitable donations, we hope you will consider donating to FABB. FABB is an all-volunteer group that promotes bicycling as a viable transportation option in Fairfax County. FABB volunteers work with the community to make bicycling a safe, cost-effective, and easy way to get around Fairfax. We accomplish our work on a small budget so every dollar donated ensures that we can continue our efforts. In 2013, we need funding for maintaining our website, purchasing bicycle safety equipment, attending bike and transportation conferences, and expanding our bike counting effort. Please help us with a year-end tax-deductible donation today. This year we have the opportunity to double the impact of your gift. From now through December 31, a very generous anonymous donor has agreed to match dollar for dollar the first $1,000 in donations. With our dedicated team of passionate volunteers, every dollar that FABB receives goes a very long way. Please donate to FABB online or send a check for "FABB" to FABB, P.O. Box 3752, Reston, VA 20195. Thank you for your support and contribution to a better Fairfax. Kent Gardens Elementary School in McLean was one of four Virginia schools awarded $1,000 mini grants. They plan to purchase two bike racks. We've been in touch with the school and hope to meet with them to discuss bicycle safety classes and possible formation of a bike train. Congratulations to Kent Gardens. The deadline for applying for the next round of Quick Start Mini-grants is December 20. The grants are great for holding bike rodeos, holding bike safety classes, or purchasing incentives for kids who participate in walk and bike to school days. 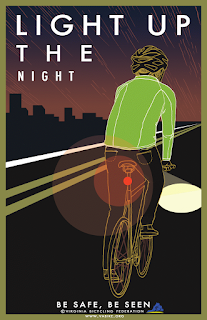 Virginia Bicycling Federation recently created two new safety posters that can be downloaded and printed. "Light up the night-Be Safe Be Seen" encourages cyclists to use front and rear lights and to wear visible clothing. Virginia law requires that bicyclists use front and rear lights at night on roads with a speed limit of 35 mph or greater. On roads with lower speed limits a front light and rear reflector are required but it's recommended that you use both front and rear lights. 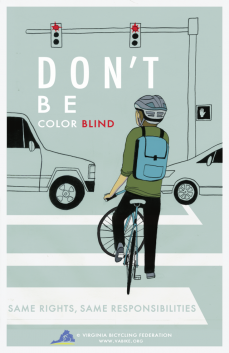 The second poster has a more subtle message, "Don't be color blind-Same Rights, Same Responsibilities." It took a minute to figure out that "color blind" was referring to the red light signal in the image. Having the word "blind" highlighted in red was a clue. Kudos to VBF for creating these posters and making them available to the public. FABB will be holding bike safety events this winter. We just heard that our grant application for purchasing lights and reflective gear was approved so we'll be stocking up on lights and reflective pants straps; stay tuned for more info about those events. A group of current or emerging citizen leaders and other interested individuals from around the Washington region gathered recently to learn about how transportation decisions are made in the region and how to become more involved in the decision-making process. The 19 individuals, each of whom has been recognized as a force of change in his or her respective community, met on Thursday, Nov. 29, and Saturday, Dec. 1, for the Transportation Planning Board's Community Leadership Institute, or CLI, normally held in the spring and fall each year. The first CLI took place in 2006 after TPB staff conceived it as a way to help citizen leaders connect the interests of the local communities and organizations they serve with the broader challenges facing the entire metropolitan area. Since then, the TPB has hosted ten CLIs. At the most recent one, Todd Turner, who attended a 2008 CLI and now serves as the Chair of the TPB, welcomed participants and encouraged them to get more involved in regional decision-making. A diverse agenda of educational presentations, experiential group learning, and interactive discussions has always been central to the CLI curriculum. Key presentations provide participants with information about the TPB and its partners, including state and local departments of transportation and elected officials, and help explain the many different processes -- at the regional, state, and local levels -- for developing and advancing individual transportation projects. Presentations also describe some of the key transportation challenges facing the region, especially worsening roadway congestion, inefficient land-use and development patterns, and severe funding shortfalls. One of the main interactive group activities at the most recent session emphasized the crucial link between transportation and land-use and highlighted the challenge of accommodating future growth in the region. In the first part of the exercise, groups each proposed on a map where to concentrate the growth of nearly 700,000 new households and more than 1.3 million new jobs that is forecast to occur through 2040 and what transportation improvements need to be made to accommodate the new growth. Groups also had to confront the region's funding challenges in the second part of the activity by adding up the costs of their proposed improvements and identifying sources of new funding to pay for them. One of the other main activities in the curriculum called on participants to assume the roles of different neighborhood-level interest groups in tackling a fictitious local transportation issue. The activity underscored the obstacles and opportunities that exist in trying to build consensus among people who have differing opinions and perspectives. Peter Shapiro, who served on the Prince George's County Council from 1998 to 2004 and as Chair of the TPB in 2003, facilitated the workshop. On Wednesday, Dec. 19, during its next regularly-scheduled meeting, the TPB will hold a brief ceremony to honor the 19 "graduates" of this fall's CLI session. The date of the next Community Leadership Institute has yet to be set, but once it is, the TPB and its staff will begin to recruit individuals who are interested in attending and invite them to submit a formal application. Public transit should be an integral part of the widening project, preferably on dedicated right of way. That right of way could be shared with bicyclists. We strongly support the inclusion of multi-use sidepats on both sides of Route 7. These sidepaths should have the same or similar elevation profile as the roadway and be as straight as possible. If not, the route could be hilly and divergent from the roadway and would not be an efficient way for bicyclists to travel along the corridor. Intersections of the sidepaths and the roads should be designed for maximum bicycle and pedestrian safety. Curb radii should not be so wide as to allow motorists to exit without yielding to pedestrians. Pedestrian-activiated signals should use the "rest in walk" concept which allows a longer crossing signal for pedestrians and bicyclists and does not require bicyclists to stop to activate the signal. Motorists are not required to get out of their cars to push a button to cross intersections, and trail users should not have to do the same, especially along the mainline of Route 7. There should be close coordination with the VDOT project to replace the Route 7 bridge over the Toll road that is located just east of this project. The trail through the Toll Road intersection should be grade-separated, and the transition between the two projects needs to be planned carefully. Kate writes the bike blog Lane Change. According to Kate, she is "a DC-based reporter shifting from the driver's seat to the bike lane. And you can come along for the ride."